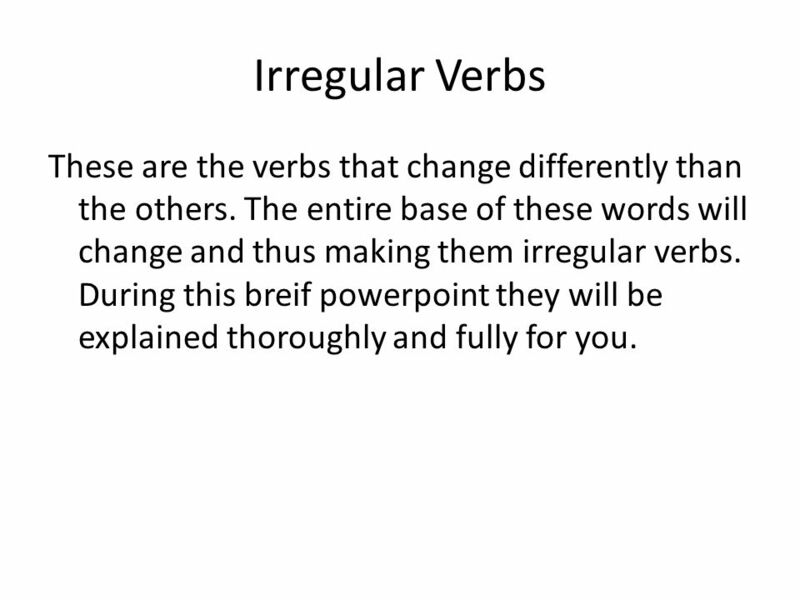 2 Irregular Verbs These are the verbs that change differently than the others. The entire base of these words will change and thus making them irregular verbs. During this breif powerpoint they will be explained thoroughly and fully for you. 4 Zweite The next thing to remember is that when the base changes it is not ever the same as the others in how it does change. 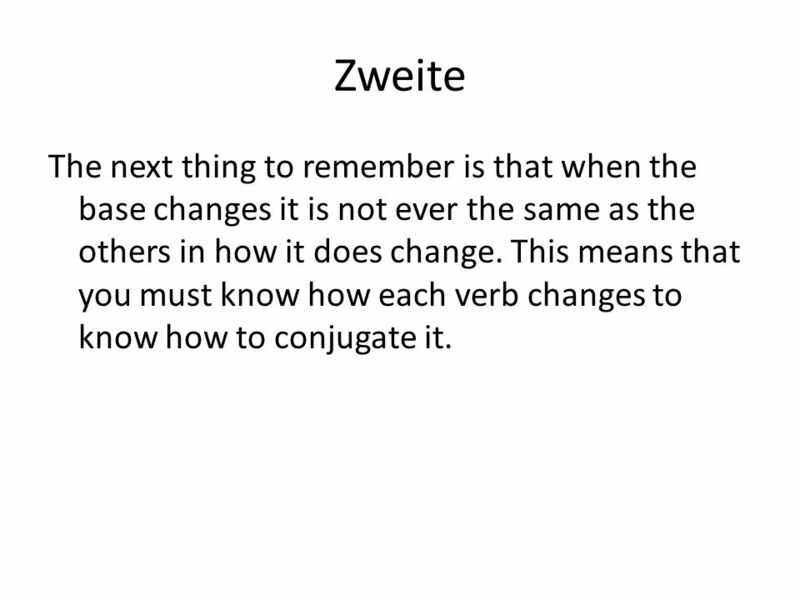 This means that you must know how each verb changes to know how to conjugate it. 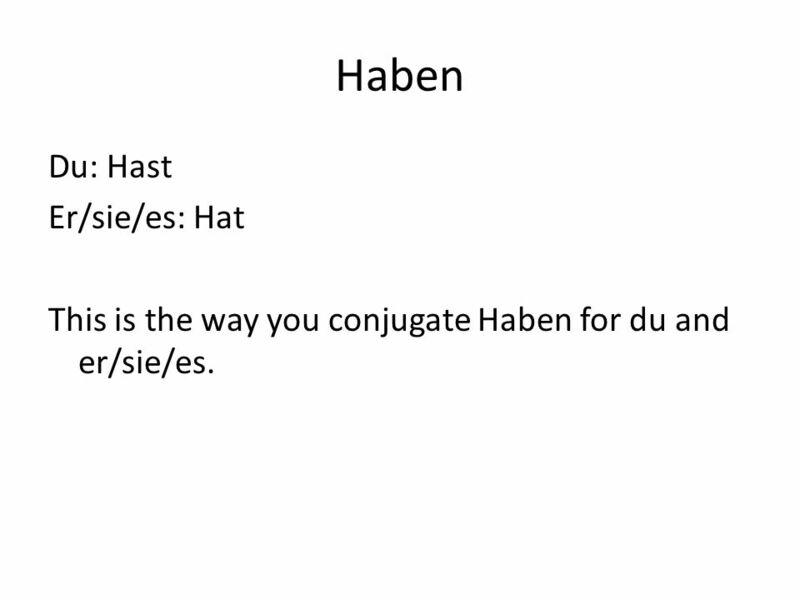 5 Haben Du: Hast Er/sie/es: Hat This is the way you conjugate Haben for du and er/sie/es. 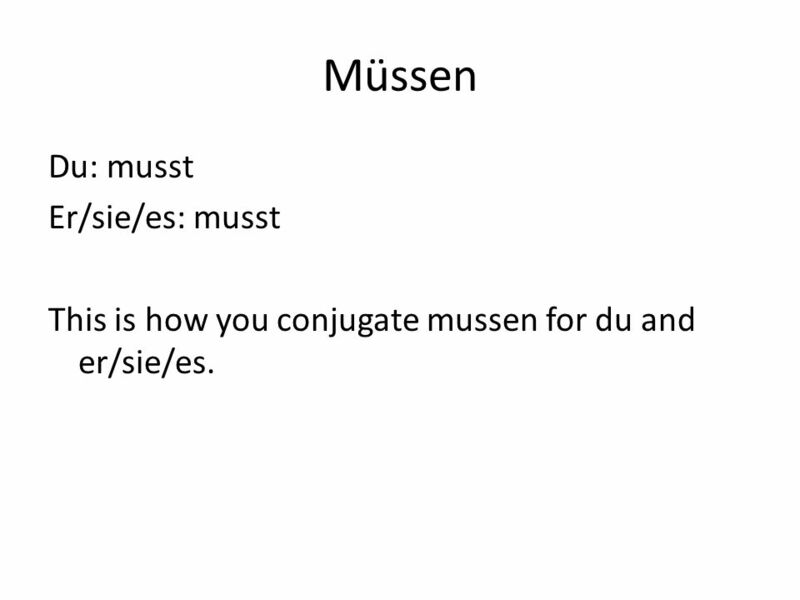 6 Müssen Du: musst Er/sie/es: musst This is how you conjugate mussen for du and er/sie/es. 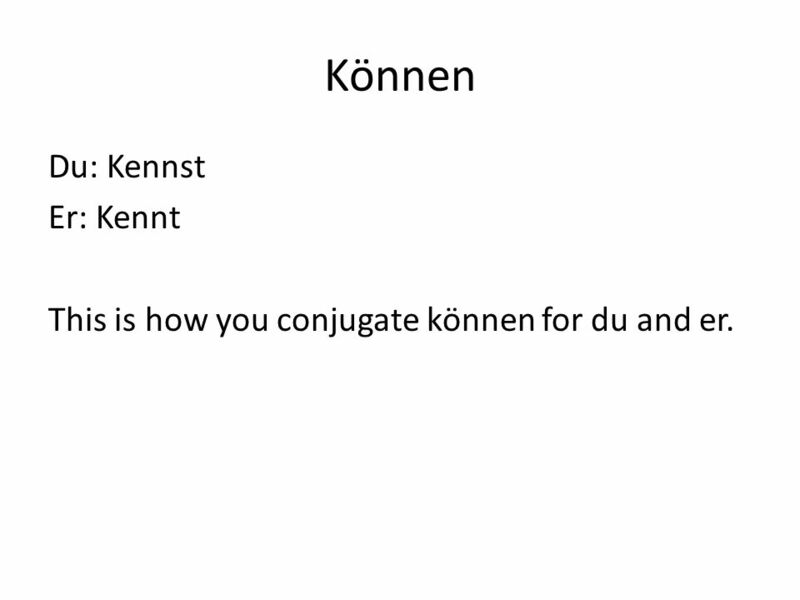 7 Können Du: Kennst Er: Kennt This is how you conjugate können for du and er. 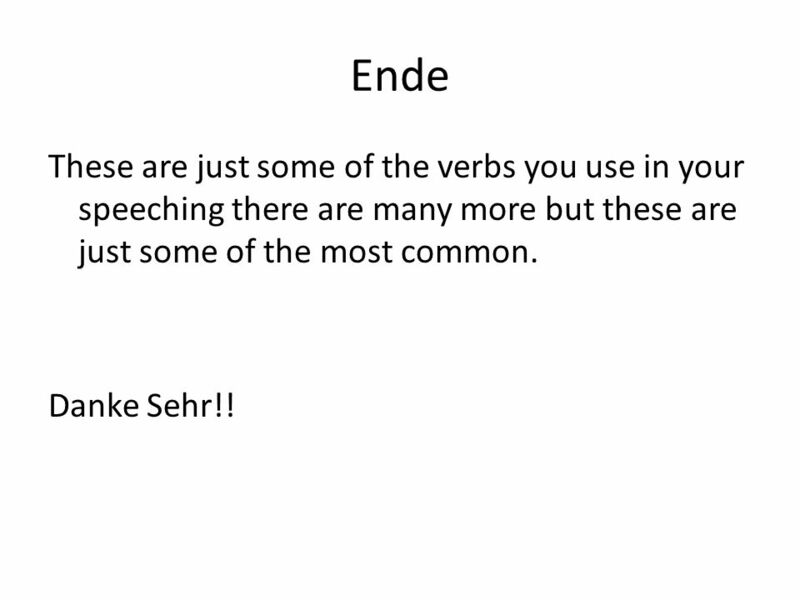 8 Ende These are just some of the verbs you use in your speeching there are many more but these are just some of the most common. Danke Sehr!! 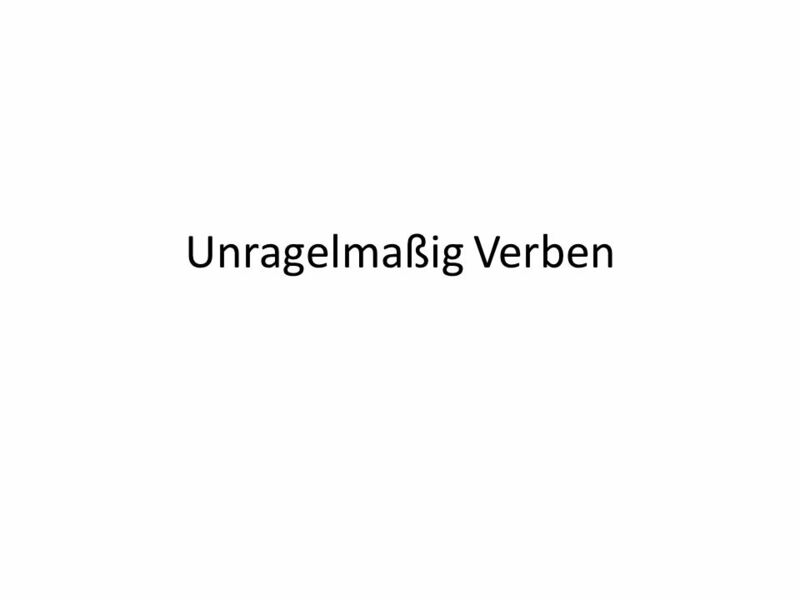 Download ppt "Unragelmaßig Verben. Irregular Verbs These are the verbs that change differently than the others. The entire base of these words will change and thus." 1 Stem-changing verbs Present tense. 2 Irregular verbs What irregular verbs to do you know? What makes them irregular? Spielst du Fussball? Spielen Sie Fussball? Im Sommer spiele ich Fussball. Fussball macht Spass. (Ich finde Fussball toll!) You should have 4 sentences. The present tense is used to talk or write about events that happen now or normally. The Present Tense. Willkommen! 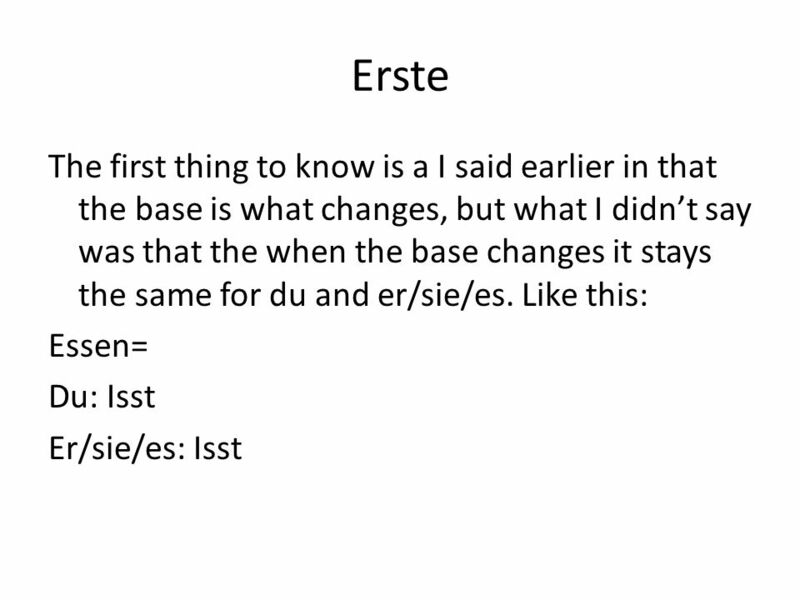 Introductions in German. Wie gehts? Du situation… Gut, danke. How are you? Good, thank you. Der Imperativ. The imperative is used for commands, requests and instructions. Anna, komm herein! (du = you, singular) Anna, come in! Jane und Bob, kommt. » Generally used for the present tense, but also commonly used with the future in meaning. (the here and now) » Grammatical Structure: ˃Verb is in present. Principal Parts of Verbs of First Conjugation Verbs Present PresentPerfectPerfect Meaning IndicativeInfinitiveIndicativePassive Participle Regularvocovocarevocavivocatuscall.